I have been loving buffalo plaid lately! Every time I see a scarf, skirt, top, jacket or anything else buffalo plaid I immediately want it. While the pattern has been popular since the 1970's it used to be more associated with lumberjacks but now it's making a fashion statement in a big way. This is such a fun way to do plaid for fall and winter and looks great dressed up or down! I didn't meant to pick all images of buffalo plaid with vests but you have to admit, it's a fun look, right? I decided to put together a few looks I'd wear sporting the buffalo plaid trend. How would you wear buffalo plaid? Buffalo plaid is a fave- and I don't think I have enough of it, actually. Might have to remedy that. :) Great looks, doll! I have also been loving buffalo plaid lately! I love how people have been pairing it with other patterns and mixing it up! Your outfit ideas are perfect! I love the buffalo plaid too! And love it paired with those ripped jeans! Love this trend at the moment! I'm into that blue and white plaid shirt - I love when it's not the traditional red and black. Love! I'm the same way - anytime I see something plaid I want it. Loving it with the vest too. I love buffalo plaid! I think it is so much more fun than regular plaid and is much easier to work with and work into more outfits! Loving the plaid for sure! Especially paired with a fab vest! If I could wear plaid every day I would. I'm obsessed with buffalo plaid too lately! I recently got a similar shirt to the blue and white from Old Navy and it was only $30 :) Now i'm eyeing that dress!! I love the leopard and the buffalo plaid! I want to add some buffalo plaid to my closet now! Yes!! I've been loving buffalo plaid lately too!! Paired with the distressed black jeans is perfection! I love the navy version, though the red dress is pretty cute too! buffalo plaid is amazing! I own like three pieces and I wear the heck out of them! I have been on the hunt for a red and black buffalo plaid top and cant find anything. I love the dress you picked and how you paired with a leopard bracelet. You know my feelings about leopard! 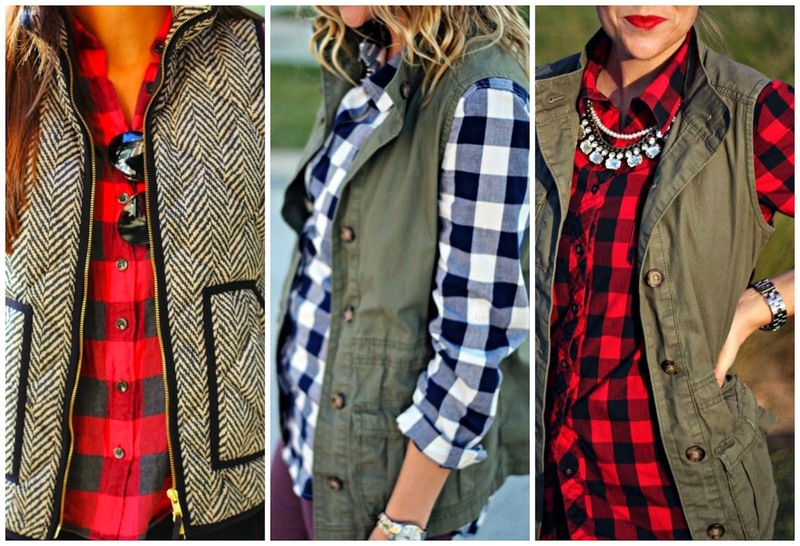 Love buffalo plaid, especially with that first picture of the herringbone vest! You put these outfits together gorgeously, love. I really, really want that plaid dress. I love plaid everything, and the length of that dress looks perfect! And I'm in desperate need of a leather jacket, they are so versatile, I can't believe I don't own one! YES I love it too and I LOVE both of those outfits! How cool is that dress?! Love the green vest! Such a warm weather essentials!! I'm loving this trend too (although I don't own any) but the real question is…. why in the world is it called that??? Lol. Love me some buffalo plaid! I've been on the hunt for a red/black shirt but haven't found one that fits right yet! The search continues!! It really does look adorable with a vest. It's too funny that you ended up picking three photos of such similar looks. I've been wanting a red buffalo plaid shirt for what feels like forever but never managed to scoop one up, definitely going to have to change that soon. I love the blue and white one you picked! Hmm wondering how my Buffalo print shirt would look with an army vest. Love this print for sure! i love the red plaid but am just not sure if i would wear it or if it would suit me. so tempting! i love the second outfit you put together. I love buffalo plaid and your choices are great!! I need that shirt! I'll take one of each please! These are great and I agree I'm obsessed with them too! I am SO into buffalo plaid right now. That dress is adorable! I'm always so uncertain about wearing buffalo plaid, but I think with a slightly oversized army green jacket, it looks absolutely stunning! Good choice for fall season! LOVE buffalo check. That dress is super cute and I love how you styled it! Love your picks and how you have been styling buffalo check!